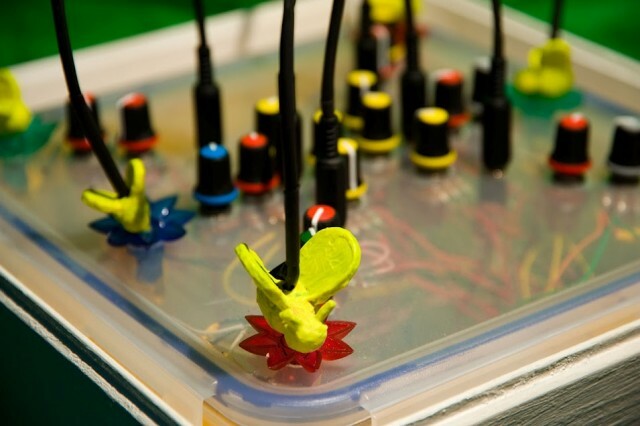 A new EP looks to bees for sound and inspiration, as well as a hive full of original gear and software patches. 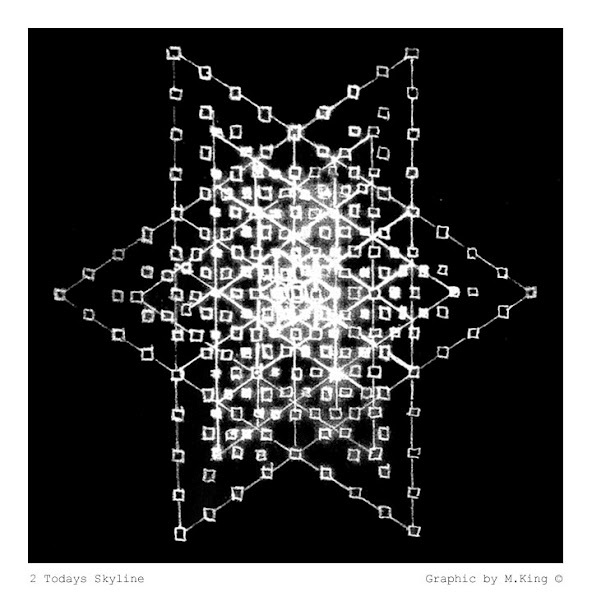 From the liner notes, track 2 – Today’s Skyline Graphic by M.King. If electronic music sometimes seems to contain the secret dance language of insects, mysterious coded rhythms and swarms of sound, an EP released this summer by an English producer makes the connection explicit. Bioni Samp sends us his strange and wonderful sonic journey into the colony. In tunes alternately atmospheric and danceable, at least of the sort to which you might wiggle your thorax in a deep, dark hive, The Island uses every possible sonic resource. Artist Bioni Samp is a producer and video artist from Leeds, Yorkshire now living in London. He points CDM not only to these wonderful sounds, but to his instrumental creations, as well. 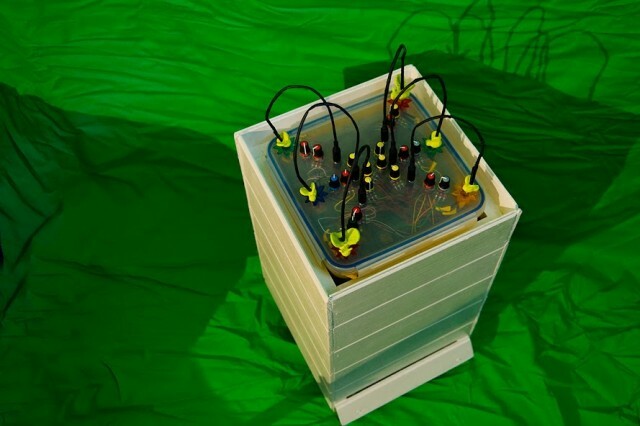 The Hive synth. Photo: Q.Smith, Yes Dear Ltd.
Hive Synthesiser (9 Oscillator prototype) Electronic Beesmoker [original], BeeVerb [original], BFX [original], Binaural Beeframe [original], Yamaha Fretless Bass, Maplin 3800 [Maplin is a UK electronics vendor; this is a vintage 1979 analog offering from them], Casio CZ 1000 [synth], Mini Sitar, MFB Drum Machines, Yamaha RX5 [drum machine], Roland 727 [drum machine], Crumar Organizer [vintage drawbar organ], Roland SH101 [synth], Make Noise René [the Cartesian sequencer module], Wiard Anti-Osc [analog waveshaping module], 8-bit delay slinky [no idea; sounds awesome], Berhringer Pedels, Faderfox Micromoduls, Ableton Max For Live 8, Max/MSP 5, Schwarzonator, Granulator by Monolake, Pure Data [open source patching software], RME A2D Linux only DIN, SuperCollider [open source software], tape recorders and microphones. 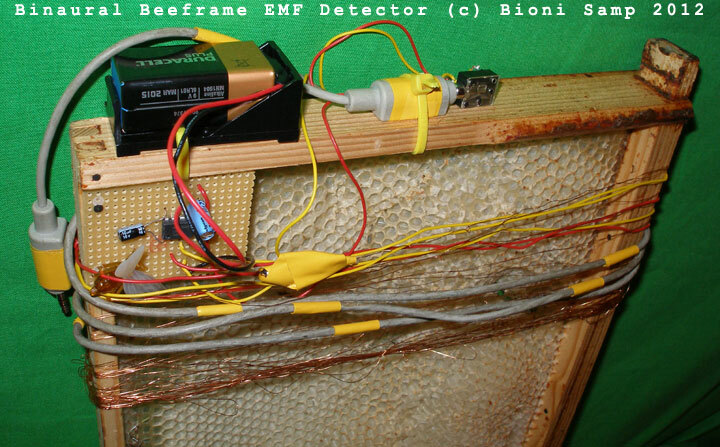 Check out the Hive DIY instrument, in particular – and, in the last shot, an EMF detector strapped to a real honeycomb. “EP” is even a bit misleading; the release is 42 minutes long and richly varied. And, despite its delightfully oddball provenance, construction, and conception, it’s getting some nice support from some bigger names. Best of all? The “press release” reads like a combination of a haiku and a pirate map. drifting over an ocean of stillness. off the shipping lanes of mental navigation. just on the horizon of the last. atlantis synthesisers are all joined by refraction. Mastered by Andrea ‘Nax Acid’ Ruffino.